Many stores have decided to make an impact and charge for disposable bags or ban plastic bags altogether. Many of these policies are in response to environmental issues or the increasing number of bans being implemented across the country. Whatever the reason, when stores charge a fee or ban disposable bags the purpose is to encourage the use of sustainable eco-friendly bags. IKEA, the Swedish home goods giant, began charging a fee to customers who used plastic bags back in 2007. This fee was designed to discourage the use of disposable bags and limit their environmental impact. Shoppers are encouraged to carry their items without a bag, purchase a disposable bag for a fee, or use reusable shopping bags. IKEA stores in the United States donated the money collected from the fee imposed on plastic bags to American Forests, the nation’s oldest citizen’s conservation group. At the same time IKEA also set steep goals to increase their recycling efforts. The fee program was such a wild success IKEA UK chose to forgo the fee and implemented a bag ban. In addition to plastic bags the chain has also dramatically increased the amount of materials they recycle. Environmental issues are near and dear to IKEA so along with their efforts to reduce plastic bag use, the Swedish chain has changed up their packaging to limit waste. Some items, like small decorative pieces do not feature any packaging, while efforts have been made to streamline the packaging for larger items, such as furniture. Fred Meyers in Portland Oregon decide to take the leap instead of waiting for the inevitable. The City of Portland passed a plastic bag ban that began in October 2011. Prior to the ban becoming a law while the city was working out the details, Fred Meyers’ stores in the Portland city limits decided to start the ban early and did away with plastic bags in August 2010. Per the megastore giant they wanted to test drive the ban before it was put into law, so they could work out any bugs and help get their customers and staff use to bringing and using reusable grocery bags. They welcomed customer feedback and by the time the ban was finalized and put into place the folks at Fred Meyers were well accustomed to a retail experience without plastic disposable bags. “We became impatient waiting for our stores’ local municipalities and other retailers to recognize the impact of bags on the environment, so we took matters into our own hands,” said Kemper Isely, co-president of Natural Grocers by Vitamin Cottage. 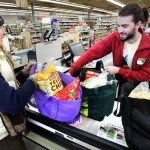 In April 2008 the store did away with plastic bags and they followed suit in 2009 by eliminating paper bags at the checkouts in their 36 stores throughout Colorado, Texas, Utah and New Mexico. On Earth Day in 2010 the chain estimated that they prevented 13 million plastic and paper bags from being tossed in landfills or littering waterways and other ecosystems over the previous year. Natural Grocers encourages their shoppers to bring reusable grocery bags, although they do provide leftover cardboard boxes for customers to carry their goods home. The store claims no major issues and that their customers enjoy and fully support the policy. Bag bans are popping up all over the place and each city, county, or even state has their own rules and guidelines, so it was very proactive of a chain like Natural Grocers by Vitamin Cottage to implement their own ban. Now if any of their stores are in a jurisdiction that implements a bag ban going forward, Natural Grocers can avoid the headache of adapting to fit the law because they are ahead of the curve. Portland’s Fred Meyers were on that track when they executed their ban. It was only a matter of time before the City of Portland imposed a bag ban so instead of waiting for the law to be written, revised, and finally passed, they just cut to the chase and said goodbye to plastic bags in favor of reusable shopping bags. IKEA’s motives were more environmentally focused and not so much in response to any bans or laws, but the end result has been the same. Customers still shop no matter what they use to carry their goods home, but when they opt to carry reusable bags they help the environment and save money for both themselves and the stores where they shop. Check out http://www.washingtonpost.com/wp-dyn/content/article/2007/03/15/AR2007031501921_2.html for more info on IKEA’s efforts. Go to http://www.oregonlive.com/portland/index.ssf/2011/10/plastic_bag_ban_portland_store.html and http://www.fredmeyermedia.com/pdfs/ReusableBag_FB.pdf for info about the City of Portland and Fred Meyers’ ban. To learn more about Natural Grocers by Vitamin Cottage go to http://www.naturalgrocers.com/store-info/bag-free-checkout.